Resume writing is tough, but we’ve cracked the code. The job search — where you stress over writing the perfect resume and slave over a cover letter. Then, you squeeze your eyes shut as you finally hit “submit” and … nothing. Well, that was disappointing. Putting yourself out there only to receive radio silence can be extremely discouraging, and Andrew Djang would agree. When his company was acquired and his opportunities for growth stunted, he began the hunt for a new role in the oil and gas industry. After a year and a half of sending out applications in fits and starts, he’s still coming up empty. The thing is though, Andrew is highly qualified for the positions he is applying for. So then, why have there been so few bites after sending out applications for so long? Andrew had a hunch that his resume was the root of the problem, so he submitted it to TopResume’s resume-makeover contest — and won! When we first started speaking with Andrew, it became clear that he had strong, valid concerns about his resume. But they weren’t necessarily about the existing document itself. Instead, Andrew’s anxiety stemmed from the seemingly futile task of creating a resume that would please everyone. Remember Sisyphus? He’s not alone in his frustration. The rules of resume writing can seem complex and nebulous; you know they exist but you can’t quite figure out what they are. That’s why professional resume-writing services like TopResume exist — to simplify the process and give you the stellar resume you need to finally land the job. Andrew was paired with TopResume writer Dan, who helped get his resume on the right path. Let’s take a closer look at the improvements he made. Andrew told us something that we hear quite often: He knew that these resume rules exist, but he didn’t know how to deal with them. As a result, he simply chose to submit his resume for every appropriate opening he could find, hoping that sooner or later, lightning would strike. Sure, it may occasionally, but that approach to a job search is anything but strategic. What Andrew needed to turn his resume into a truly effective document was a professional hand like Dan — someone who knows the ins and outs of keywords, skills sections, and applicant tracking systems. He came to realize that if you want to get employers to notice you, you have to speak their language, not just a language you think sounds nice. “If this is what my resume is supposed to look like, no wonder no one was paying attention to me,” he shared. This was one of the areas where Andrew’s resume was coming up short — including contact information is crucial so that recruiters know how to find you. Therefore, one of Dan’s first steps in his professional rewrite was to add and correctly format Andrew’s contact information. 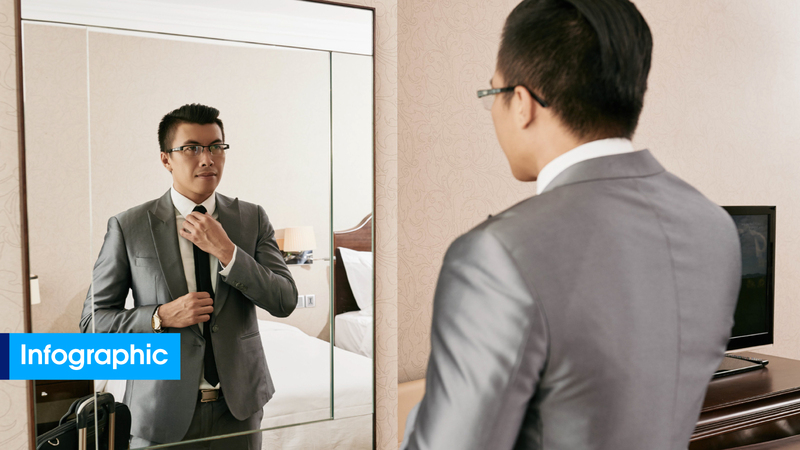 Now, when Andrew’s resume impresses, it will be easy for a hiring manager to reach out about an interview. Another important thing Andrew left out was a designated skills section. Sure, he mentioned some of these skills throughout his resume, but a table puts them front and center, making them pop out to a recruiter’s scanning eye. What’s more, it is also a great way to incorporate those pesky keywords that will please the ATS and prove that you have the relevant experience needed to succeed in the role. Andrew did take the right approach by including a professional summary rather than an objective statement. But Dan took it to the next level. He added a descriptive job title and strong power statement to encapsulate Andrew’s professional self right off the bat. This is especially helpful because of Andrew’s niche industry, so now employers can easily understand the nature of his work and why he excels at it. Is your resume making an impact? 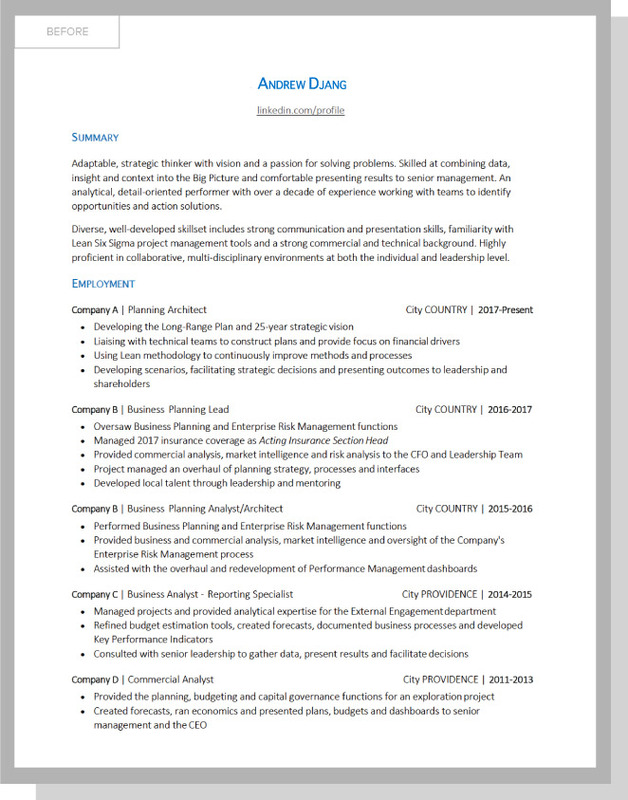 Submit for a free, objective resume critique for feedback. 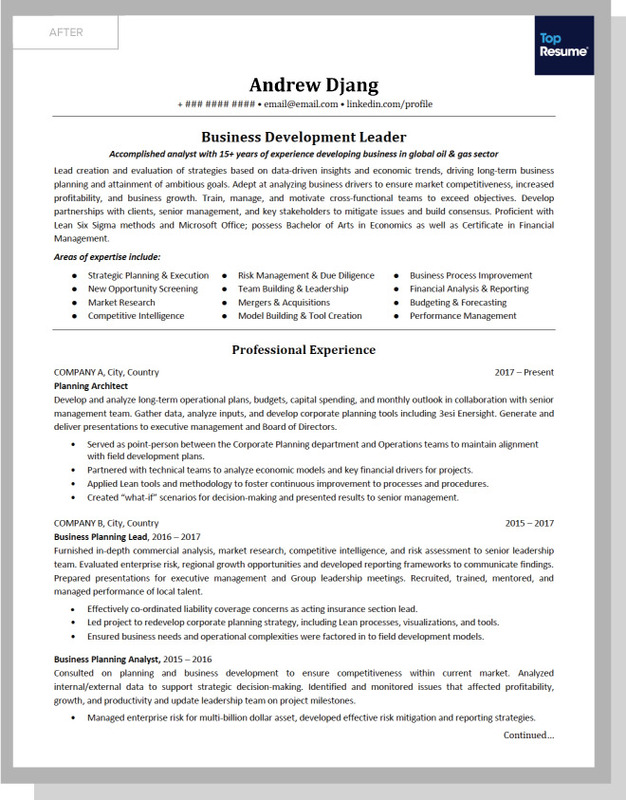 Dan also reworked the format of Andrew’s resume to ensure that the most important details don’t get lost. He differentiated between job descriptions and achievements by using short paragraphs and bullet points, respectively. This makes the accomplishments much easier to find, so a recruiter will notice them when skimming. Someone reading your resume can always go back for more detail, but you have to capture their attention first. Lastly, Dan separated Andrew’s education and professional development into two sections, which makes for easier reading and comprehension. Understandably, Andrew had some concerns about working with a professional resume writer. After all, a resume is a personal document — it outlines your history, your success, and the way you see yourself as a professional. While it may seem counterintuitive that a stranger is the right person to take on your resume, the objective, experienced eye of a professional writer is what makes the difference. If Dan needed more clarification on Andrew’s industry, he simply reached out and inquired; if Andrew needed something adjusted for accuracy, he provided Dan with the feedback. That dialogue, a hallmark of the TopResume process, is how Dan was able to keep the resume authentic to Andrew while also taking it to the next level. When asked about his makeover experience, Andrew shared that at first, it was a bit overwhelming: “I’ve been really discouraged and trying so hard to make it work. It’s hard to admit that you can’t do it yourself.” That’s where we jumped in and reminded him that we all have our own areas of expertise — his is in oil and gas, and ours is in resume writing! You can get a job-search confidence boost too. Learn more about TopResume’s professional resume-writing services. Career Quiz: Are You Prepared to Write Your Resume?